There’s lots of talk right now about the people in IT and IT service management (ITSM). It might be perceived as more talk than action, but at least the focus is finally in the right place. With questions being asked about whether organizations have enough of “the right kind of people,” the right balance of skills, and – as we exit 2018 – the wellbeing of employees. This article focuses on the state of skills, using the Digital Skills Landscape 2018 report, from SkillsTx and BSMimpact, to highlight the current state of skills availability in IT. You might not have heard of this report before – it’s a periodical analysis of the capabilities, competencies, and skills of IT professionals. You can download a copy here. It starts with the premise of: What skills do we have? What skills do we need? And leverages the Skills Framework for the Information Age (SFIA), which provides a set of descriptions of digital, cyber, and ICT skills (and responsibility characteristics) that have been adopted by companies in nearly 200 countries. 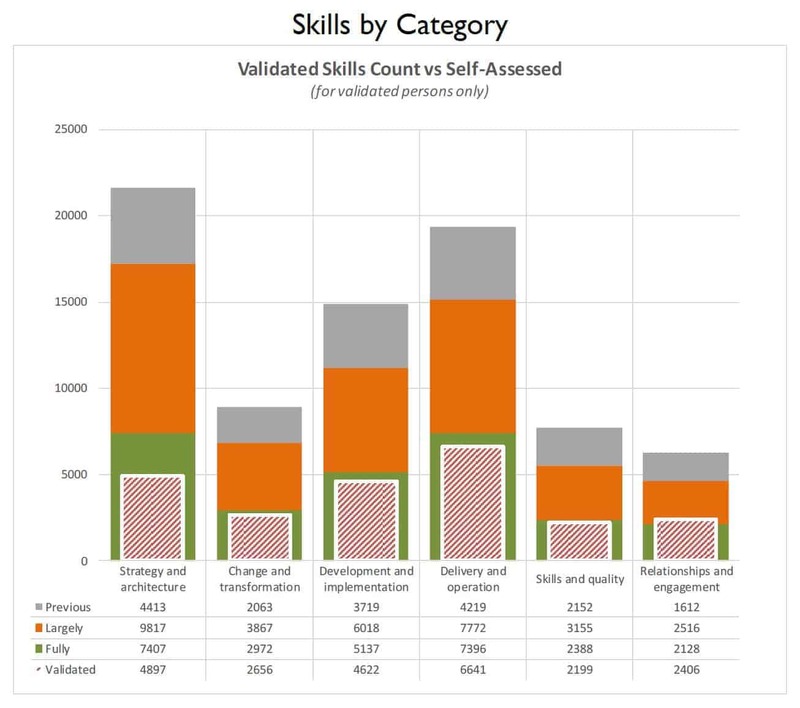 The data analyzed in the 2018 report is from 4,902 individuals within a spectrum of organizations who have used SFIA to produce a baseline of their current skills through self-assessment, and data input by assessors who have conducted one-to-one skills discussions to gather verbal evidence to produce a validated assessment for 2,915 of these individuals following the self-assessment activity. There are six “uber” skills categories contained in SFIA, which are shown below, along with the count of self-assessed and validated skills for the assessment participants. To explain the above bar chart, and the various colors: During self-assessment, individuals are asked to state how well a SFIA description of a skill (at a level) applies to them and their experience. Selecting “fully” for a match of 85% or more, “largely” for a match of between 50% and 85%, and “previous” where the description matches a skill which is not considered current but was possessed earlier in the individual’s career (seven years ago or more). Participants were also offered an option where the match was less than 50%, and therefore was not considered a good match. Through independent validation, we can find relationship and engagement skills that people didn’t recognize in themselves during self-assessment. Do People Have More or Fewer Skills Than They Think? The second and third of the above bullets have hopefully got you thinking about the accuracy of the self-assessment of skills. Are we overly humble in our opinion of our skills or is it the reverse? The report assesses this too – with the results shown below. 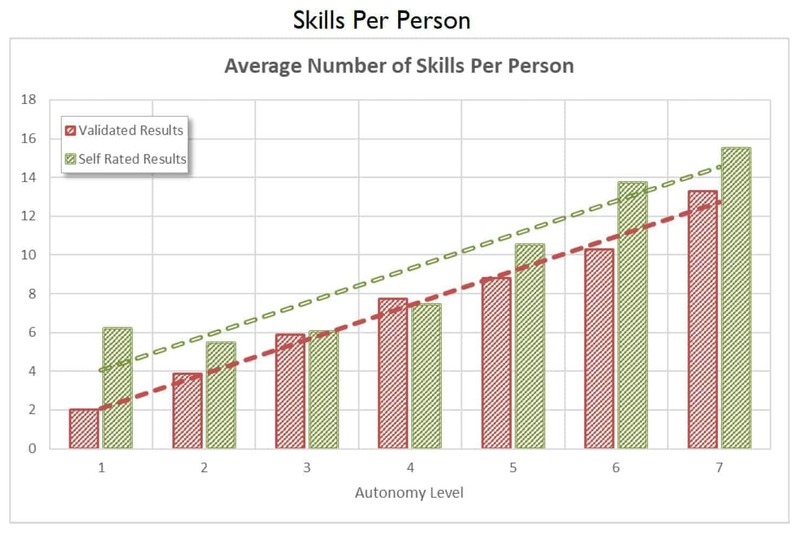 The above chart shows that, with the exception of Level 4 Autonomy, most people identify more skills in their self-assessment compared to when they attend a skills discussion session with a SFIA Accredited Consultant to provide a certified skills profile. And this seems to increase the higher up the levels of responsibility. One possible explanation for this is that people-managers and senior leaders often confuse responsibility and accountability. There are different skills needed to ensure accountability, typically much fewer than the skills needed to execute responsibility. And because senior managers often defer responsibility to others in their teams, but continue to remain accountable, they often assume they have skills for activities they’re not actually responsible for carrying out personally. Therefore, we observe that many managers incorrectly self-select the skills of their team in addition to their own skills. 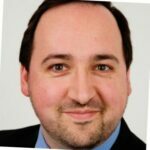 Hopefully this article has raised a few eyebrows about skills, and you’d now like to understand more about the current state of skills in IT (and perhaps how SFIA adoption will help your organization).